Hélène Lefrançois, a teacher candidate in the consecutive education program at the University of Ottawa, is known as an accomplished researcher with a very impressive record and a true dedicated passion for today’s youth. Lefrançois is the 12th recipient of the Joseph W. Atkinson Scholarship for Excellence in Teacher Education. Her vast experience - teaching primary grades in Québec, helping immigrant children learning French or planning and leading a course on the power of language at the University of Ottawa for high school students, taught Hélène to always keep an open mind and to show respect for others. For her, her first duty is to champion the ethical values of the profession: empathy, respect, trust and integrity to better pass them on to students to ensure they become responsible citizens capable of living in society. Before coming to Canada, Lefrançois lived in France where she worked in recreation with young people from four to 25 years of age, particularly children with social adjustment problems from the so-called “difficult” neighborhoods of France. In her role, she coordinated theme-based interactive activities for 4,000 visitors, organized a carnival held for 2,000 children and led three-week vacation trips. She is particularly fond of a visit she organized in the mountains of Jura, France, in winter, with several children from underprivileged neighborhoods who had never seen the snow before. The Ontario College of Teachers awards the Atkinson scholarship annually in honour of the College’s second registrar Jospeh W. Atkinson. To win, teacher candidates must study at a faculty of education in Ontario and achieve outstanding academic success in their undergraduate studies while demonstrating a high level of preparedness for teacher education. 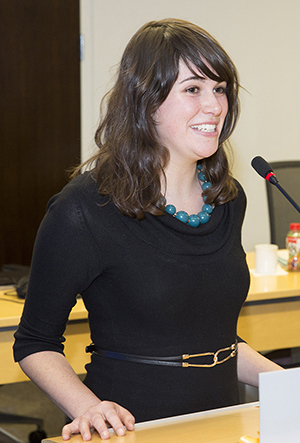 By the time she was 11 years old, Rosalind McCanny, a teacher candidate in the consecutive education program at Queen’s University, had lived in four different cities – Saskatoon, Montreal, Winnipeg and Ottawa – and was exposed to multiple teaching styles. She developed a deep appreciation for teachers who foster respectful, nurturing and inspiring learning environments and wants to create similar positive learning experiences. McCanny is the recipient of the Ontario College of Teachers Primary/Junior or Junior/Intermediate Scholarship. “I aspire to stay true to my morals, to always act with respect and care for my colleagues and students, and to try to leave all situations a little better than I found them,” she said. Charming, genuinely enthusiastic with crackling intelligence and exceptionally strong creative and analytical abilities – this is how she is described by people who work with her. McCanny has worked passionately with children and teens in a variety of contexts including as a caregiver, private tutor, camp counsellor and workshop facilitator. Throughout high school, she worked with a family who had four children. She encouraged them to build new skills through activities like creating stories, inventing outdoor games and baking new recipes. All four children had special needs: two boys had severe Attention-Deficit/Hyperactivity Disorder (ADHD), one girl was blind and one boy was blind and had cerebral palsy. This experience made McCanny strive to create her future classroom as a caring environment and design lessons that draw on multiple intelligences that are adaptable to different needs and levels of understanding. She has been volunteering with a non-profit organization called The Otesha Project, helping to lead educational cycling tours throughout Canada, presenting workshops and plays to students about sustainability and social justice. As part of this project, she once cycled from Calgary to Vancouver with a group of youth to present their ideas to various communities. 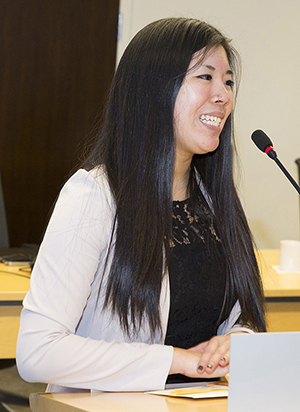 Stephanie Lum, a teacher candidate in the consecutive education program at the University of Ottawa, has a real passion about positively impacting lives of children. She has been a summer camp activity leader and in science and engineering and a science teaching assistant. What did she teach specifically to children? How to dissect squid and crayfish. Identify the organs of a fetal pig - And explain their functions! Lum is the recipient of the Ontario College of Teachers Intermediate/Senior Scholarship. She has a bachelor of science in biopharmaceutical sciences with medicinal chemistry, and received the Faculty Plaque for achieving the highest standing in her program. Her volunteer work has led her to Germany, on missions trips to Guatemala and on Manitoulin Island. Her interactions with aboriginal children from impoverished and broken family situations helped her to gain their trust by treating them with respect. “There is power in a smile, a kind word, and a listening ear. I strive to be a caring teacher, and dream of making a positive difference in the lives of my students,” she says. She is known to be a dynamic, enthusiastic and confident speaker and to give her best of her ability in every situation. Every Sunday morning, for the past four years, Stephanie has been going to the Metropolitan Bible Church where she teaches Bible lessons to 30 two- and three-year-olds including some with developmental delays. Their parents have praised her remarkable investment and engaging lessons in making their children learn and feeling encouraged. The Ontario College of Teachers Scholarship Program supports and sustains excellence in the teaching profession by reinforcing high standards and professional competence. It rewards tomorrow’s educators who model the values of teaching as a respected and forward-looking profession.